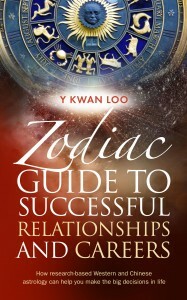 Kwan’s keen personal interest in Astrology started over 30 years ago when he ventured to confirm the key personality traits associated with each star sign (24 in total), for both Western and Chinese Astrology. His marriage to his wife, Cheng (married 34+ years), was partly influenced by her birth date! For many years, he has collected birth data and noted the careers of renowned people, from whom he has found many interesting and significant correlations. Essentially, the careers of these people seemed to be largely shaped by their personal preferences, natural aptitudes and particularly, the invisible/unconscious links with their unique personality profiles. He has met countless people and couples, whose key personality traits were compared to the stereotypical profiles according to traditional Western and Chinese astrology. This book is the result of spending years in meticulous refinements, largely based on these real life researches. Kwan was born in Ipoh, Malaysia before coming to study in UK in 1969. He graduated from King’s College London with a BSc(Eng), became a Chartered Engineer, and later gained a MBA from London Business School. Since 1989, he has worked as a mentor/coach and management Consultant, advising clients on varied challenging business and management issues, including effective teamwork, compatible relationships and potential career fit for people using his self learned knowledge of Astrology. As mentioned in my bio above, my interest in astrology started more than 30 years’ ago when I was seeking a wife in Malaysia. I asked myself: “Is there anything out there to guide me?” I turned to the ancient philosophies of astrology of both the Chinese and Western world. For years, I collected much info about famous couples and successful people (over 24,000), Hence this book. I spent over 8 years, part time compiling this book. I gathered thousands of obituaries from newspapers, books, and from websites for the birthdays. Using Excel and an ephemeris, I built my database, and filled in the knowledge using Word. It takes much commitment to write a book, which may not turn out to be really successful. The satisfaction of seeing one’s book in print is tremendous ! I guess that one must have the self belief and interest to share the knowledge or experience. It will survive for many years to come as people enjoy tactile things although fiction can be read on a tablet. My book should be treated like a reference book.